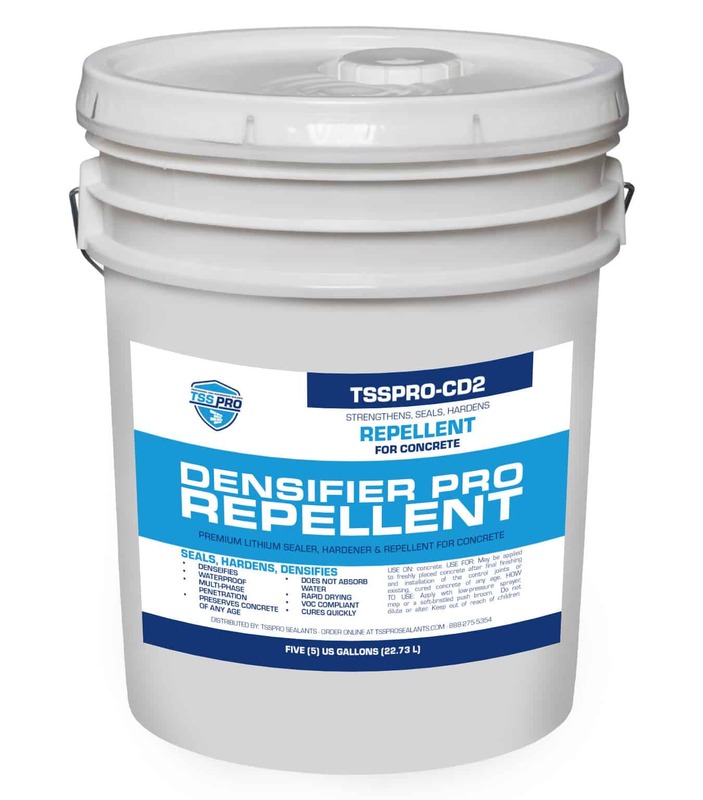 TSS Densifier Pro is a powerful water-based sealant that prevents water entry and dramatically densifies and strengthens concrete and concrete products of any kind with permanent results. NOTICE: This product is VOC Compliant. DESCRIPTION Densifier Plus Repellent (TSSPROCD2) is a state-of-the-art premium densifier, hardener and water proofing sealer for new and existing concrete surfaces. TSSPROCD2 is a multi-phase penetrating lithium colloidal based proprietary silicate treatment that reacts with the concrete to produce insoluble calcium silicate hydrate that locks aggregate together and fills vacant concrete pores while building a water-resistant matrix. TSSPRO-CD2 like CD1 reacts with concrete to produce insoluble calcium silicate hydrate within the concrete pores that locks aggregate together and fills vacant concrete pores. In addition, it builds a superior water-resistant matrix. TSSPROCD2 integrally waterproofs, densifies, strengthens and preserves concrete of any age at any point during the concrete’s useful lifespan. Penetrates and reacts quickly to produce better initial and ultimate hardness. Easy, one step application. No flushing, no scrubbing, no caustic wastewater. May be applied to broom finished, steel troweled, power troweled or burnished concrete finishes. Provides superior abrasion resistance than conventional hardeners. Produces a fast surface gloss which improves with traffic and maintenance. Improves performance, appearance and light reflectance of new or old concrete. Will not contribute to surface crazing. High lithium content combats surface ASR. Gloss and hardness do not reduce slip resistance. Breathable and UV stable. Will not yellow, discolor, peel or flake. Cures quickly. Most floors can be opened to traffic within one hour of treatment. Treated surface are easy to maintain and require no waxing. TSSPRO-CD2 is safer, easier and faster to apply than conventional sodium or potassium silicate-based products and it is water repellent. It can be applied with a low-pressure pump up sprayer, mop or a soft-bristled push broom. In addition to greatly increased surface hardness,TSSPRO-CD2 reduces dusting and simplifies maintenance producing a cleaner, healthier environment for years. TSSPRO-CD2 is VOC compliant. TSSPRO-CD2 should only be applied on concrete surfaces and products containing cement.